The Wedding Chicks LOVE Details Details! Jeannie, Michelle, and Brooke are amazing! We have personally worked with Details Details a few times and are looking forward to our wedding coming in the near future with them! We adore the wedding shown about, so subtle and cool! We are also huge fans of the family style seating and the chandeliers! 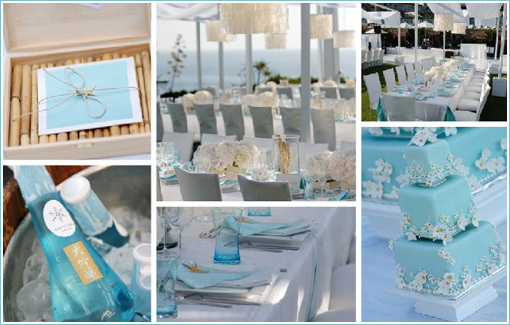 What better way to style an ocean front wedding! Established in 2003, Details Details is a premier full service event planning and design company specializing in distinctive weddings, lavish events and corporate functions. We believe that every successful event begins with impeccable planning and communication. Our goal is to capture each DETAIL and ensure that none are overlooked. Details Details is able to accommodate the wide ranging needs of our wedding clients by offering several levels of service including shaping or refining design, day-of wedding event management, or producing and executing your entire event. No matter which service you select, we promise that you will save valuable time, energy and enjoy a more comprehensive and less stressful event planning experience.